Thanks to a hostess gift I have a bottle of Viniq Liqueur, a lavender colored liqueur with a vodka base, Moscato and an infusion of exotic fruits. It also shimmers. Yes, shimmers, thanks to an edible cake decoration ingredient. It's really cool looking when you shake it, a little like a cross between a lava lamp and a snow globe. If you drink it straight this shimmer transfers to the glass, if mixed the shimmer dims a bit, but you can see below that the effervescence from the Champagne in my cocktail does still bubble up a nice shimmer. It's also not bad tasting, with a decidedly tropical fruitiness, though a bit sweet for my taste. It reminded me a lot of Hypnotiq's Harmonie Liqueur, which also has a vodka base and fruit infusions but uses Cognac in place of the Moscato. As for the overly sweet taste, well, there are ways to deal with that and thanks to it being New Year's one of those ways had to be Champagne! A few dashes of Angostura bitters, a little fresh mint and a splash of orange juice and you have a pretty, interesting cocktail that shimmers back at you. It's like a little sorcery in a cocktail glass. Create a long spiral orange twist by pulling the channel knife around the orange rind until you get about 10". Twist this around a pencil and place in the freezer along with your coupe. 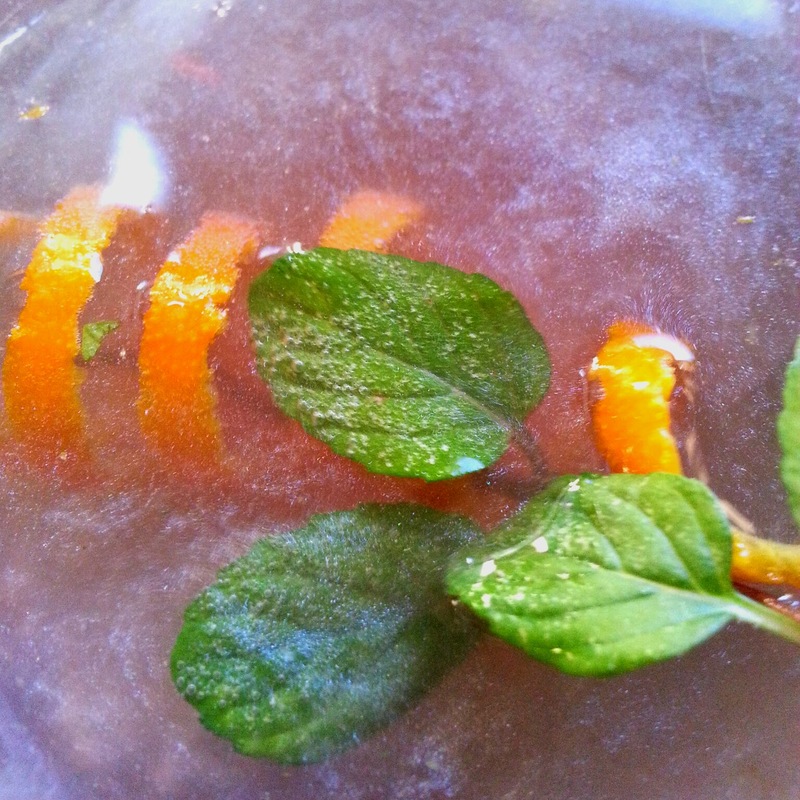 Add the mint leaves and orange juice to a cocktail shaker and muddle to release the mint oils. Add a cup of ice then pour in the Viniq Liqueur, add the Angostura bitters and shake until chilled. Drape the orange spiral half in and half outside the glass, thread the mint sprig through the spiral then strain your cocktail into the glass. Top off with the Champagne, twirl the twist so your guest will see the shimmers and serve. Be sure to put the bottle nearby so your guests can play with it. Check out this short video for a look see. If you're going out to party please have a designated driver or hire a car tonight! Have a fun, safe and joyous New Year's Eve and I'll see you next year! Whether you're having a celebration, toasting the holiday season or just love bubbly it's always fun to learn a little background on this effervescent wine and, of course, have a few choices of Champagne Cocktails to take advantage of your favorite sparkling wine. Dom Pierre Pérignon, a French Benedictine Monk who lived in the late 1600's, said drinking Champagne is “like tasting the stars.” And he should know, being a contributor to the elevation of Champagne over the common red wines of the times. 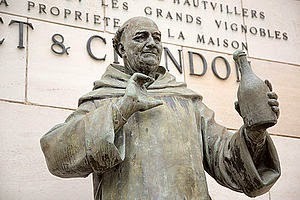 The famous Dom Pérignon Champagne, the prestige cuvée of Moët & Chandon, is named for him, which is interesting because he spent his life trying to prevent the bubbles in Champagne, calling this result "mad wine" which was unpredictable and prone to explosion from the fermentation methods used in his day! All the same, he is kind of the spiritual Godfather of our present day sparkling wines and we have him to thank for getting our nose tickled as we sip our Champagne. 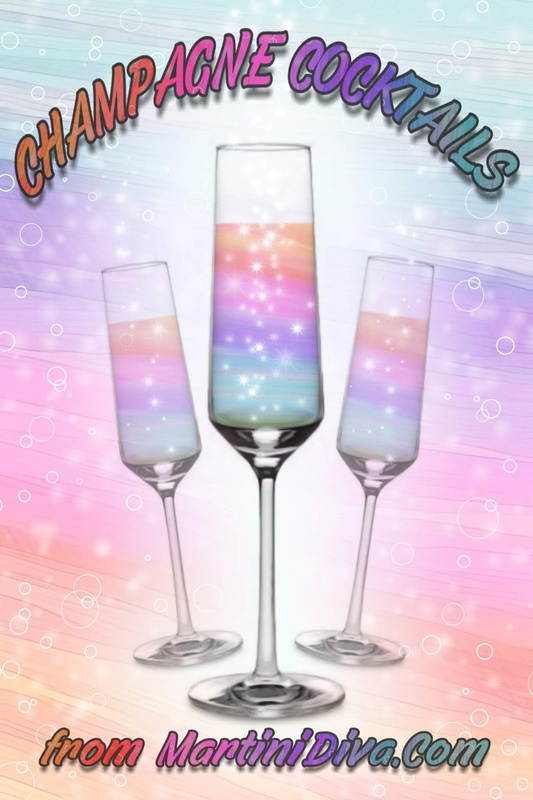 Below are some interesting ways to enjoy your Champagne in a cocktail. Since I adore bubbly there's a few to choose from. National Champagne Day is celebrated on December 31st - New Year's Eve - every year. May your glasses and your life be filled with sparkle, joy and happiness! 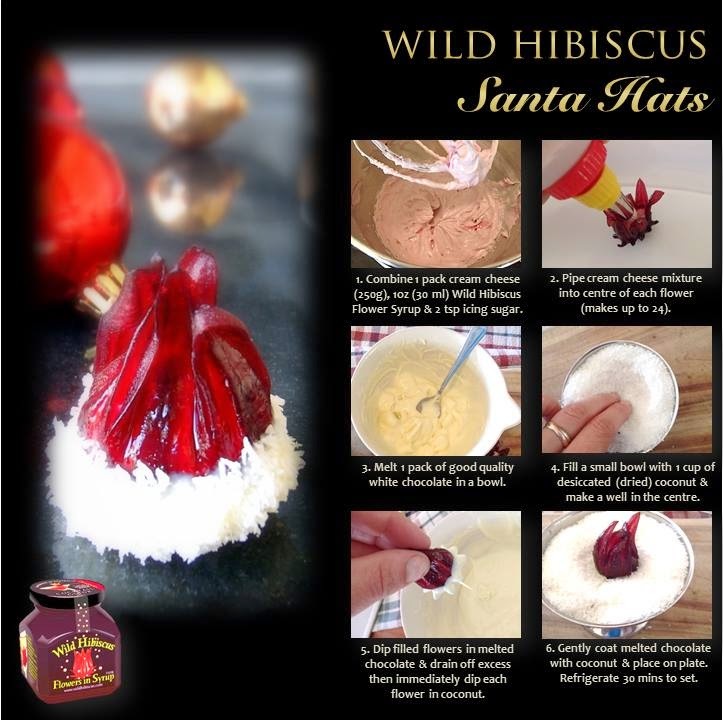 This cocktail was inspired by some fun holiday hibiscus Santa hat treats from Wild Hibiscus. I didn't get around to playing with them until after Christmas so I decided to turn them into a New Year's Eve cocktail garnish instead. Then I had to come up with a cocktail to go with them for New Year's Eve that included Champagne because I don't do New Year celebrations without Champagne! COCKTAIL DIRECTIONS Chill your martini glass in the freezer. Fill your cocktail shaker with ice then pour in the vodka, lime juice and the white cranberry juice and shake until chilled. 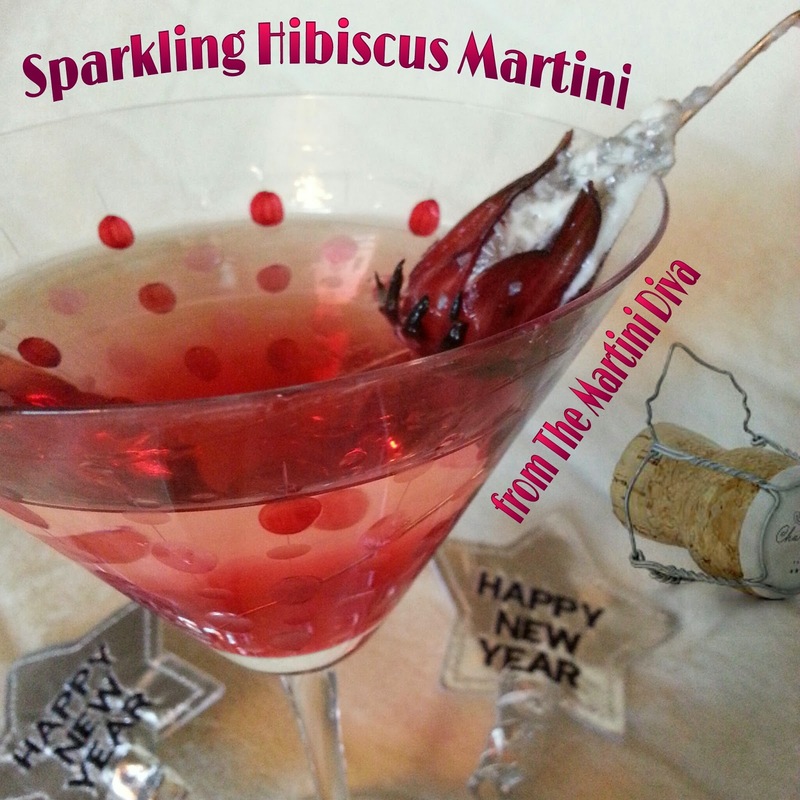 Pour into your chilled martini glass, slowly add the hibiscus syrup (which will sink to the bottom) then top off with the Champagne. Skewer the cream cheese hibiscus flower onto a cocktail pick, add to your cocktail and serve. Be careful, these slide down really easy, designated drivers are a good accompaniment! Enjoy and Happy New Year's Eve Eve! 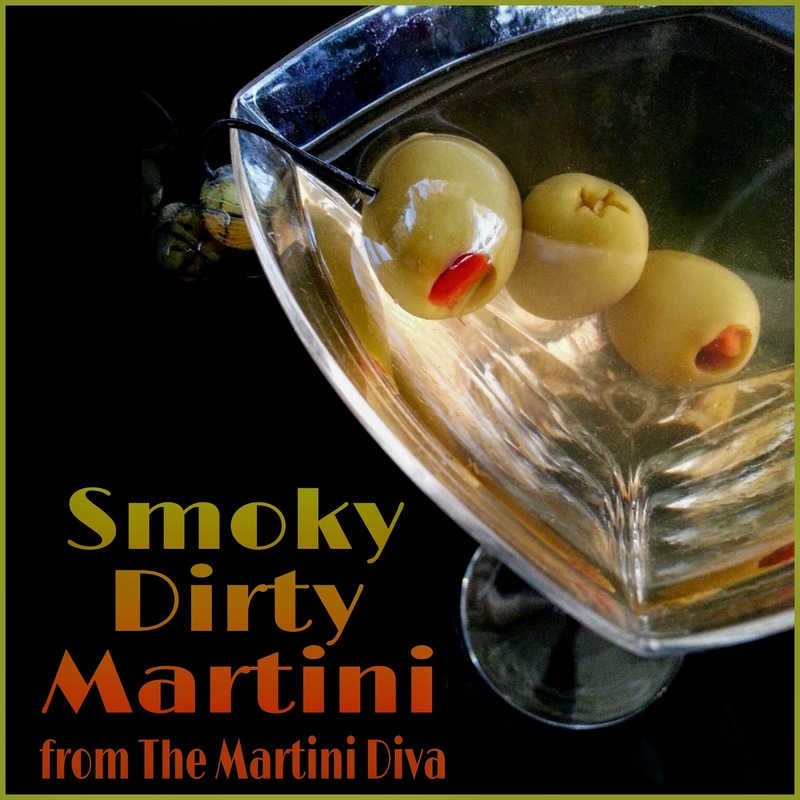 There's Gin Martinis, Vodka Martinis, Dirty Martinis and now there's a Smoky Dirty Martini! And you don't need any fancy smoking gun to make one either. I had a few friends over for cocktails this last week and one of them brought a nice bottle of vodka and a jar of Mezzetta Applewood Smoked Olives along to share (thanks, Miguel!) I popped one of the olives in my mouth and immediately knew what cocktail I was going to make for us. I made ours with vodka because he had brought vodka with him, but you can easily do the same recipe with gin. I've done both since and I prefer the gin because I love the botanicals, but the smoky flavor is more pronounced in the less flavorful vodka. It's your choice, nobody here will judge you or go into a boring diatribe about how real martinis are only made with gin . . . .
Chill your martini glass. Fill a cocktail pitcher or shaker with ice then pour in the gin (or vodka), the dry vermouth and that lovely smoky olive brine. 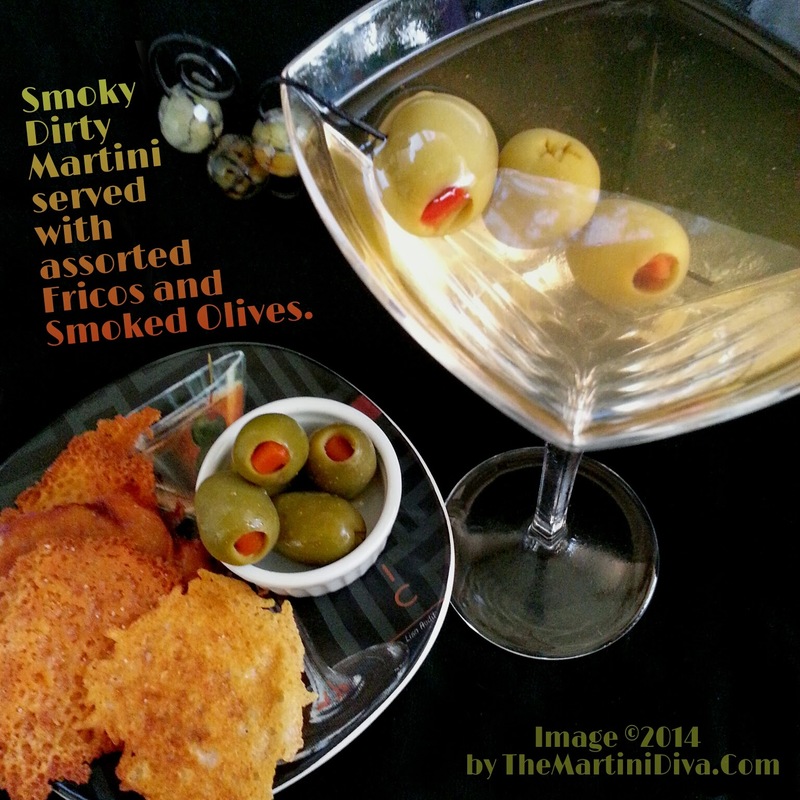 Stir or shake as desired, strain into your chilled glass and add a cocktail pick loaded with 3 of the smoked olives. I served mine up with extra Smoked Olives and some lovely, salty Fricos! Why 3 olives? Because 2 is considered bad luck! As for stirring versus shaking; shaking can "bruise" the gin and can create ice shards in the cocktail, but shaking chills the drink more (and some drinkers love those little ice shards!) Shaking also creates some cloudiness in a cocktail (from the air bubbles that are created in the shaking process) while stirring creates a clearer drink. Again, the choice is yours, martinis are a very personal experience, both in the ratio and method. If you don't know what you like, experiment! I'm not really a grinch, I'm usually most jolly, but I feel really sorry for those sad little dollies. 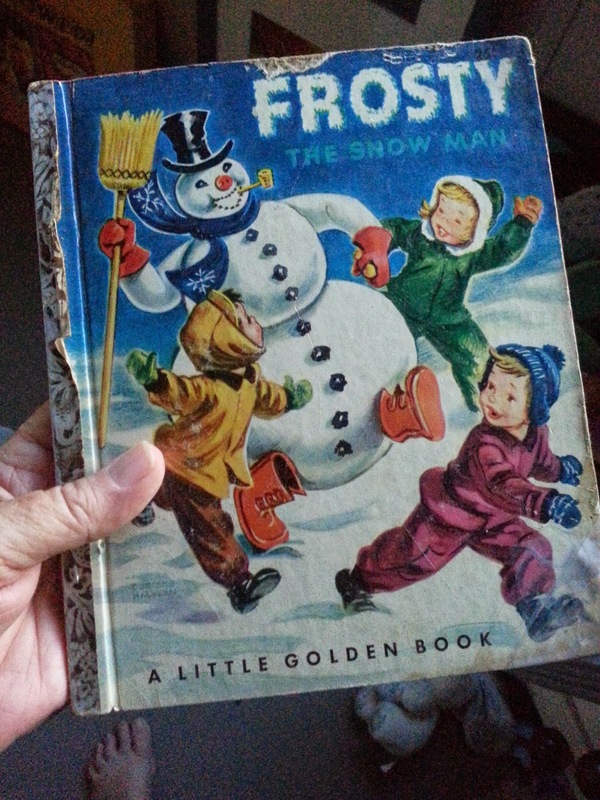 You shove them on shelves, hang them off of your holly, and those bored little elves need a cocktail, by golly! 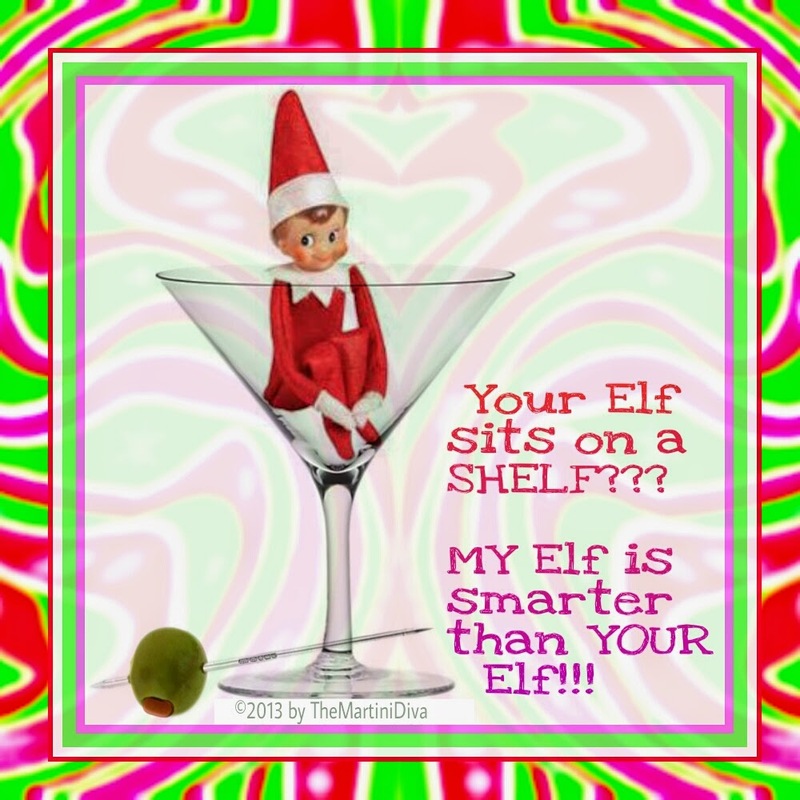 I'm down with fun memes, I'm cool with webz humor, but this elf nonsense ends with a drunk elfen rumor! 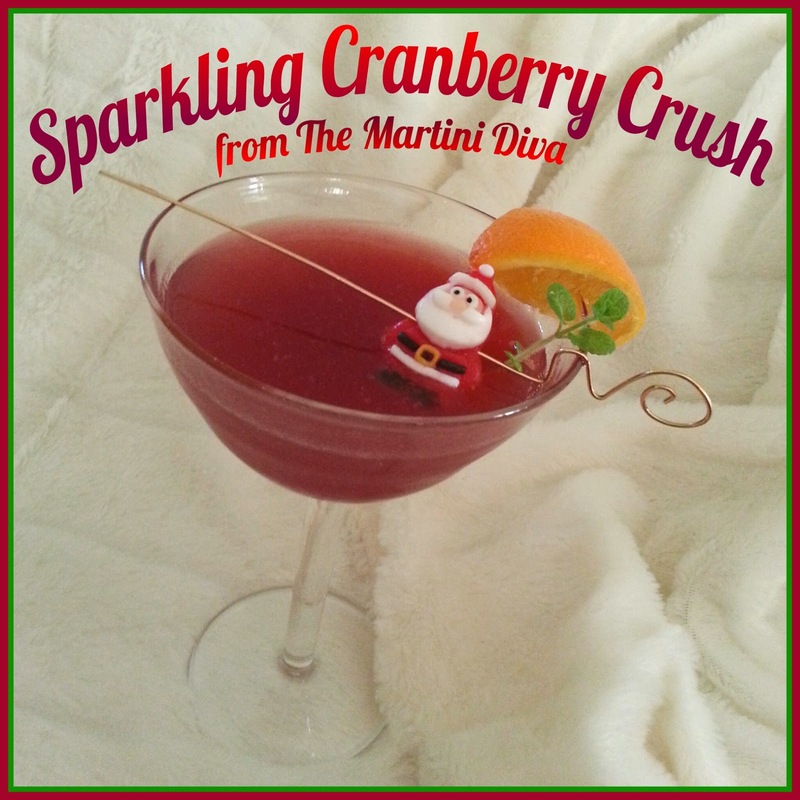 DIRECTIONS: Dip your martini glass rim and some of the Irish Cream Liqueur and then into the red sugar crystals, then chill your glass in the freezer. Fill your cocktail shaker with ice then pour in the Chocolate Candy Cane Vodka, the Irish Cream Liqueur, the half and half and the chilled coffee then shake until well chilled. 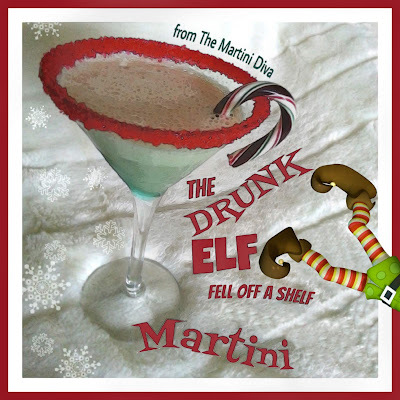 Garnish with a chocolate candy cane. Fill your glass with ice, add a drop or two of Angostura bitters, then pour in the whiskey. Add the maple syrup and the lemon juice and stir. 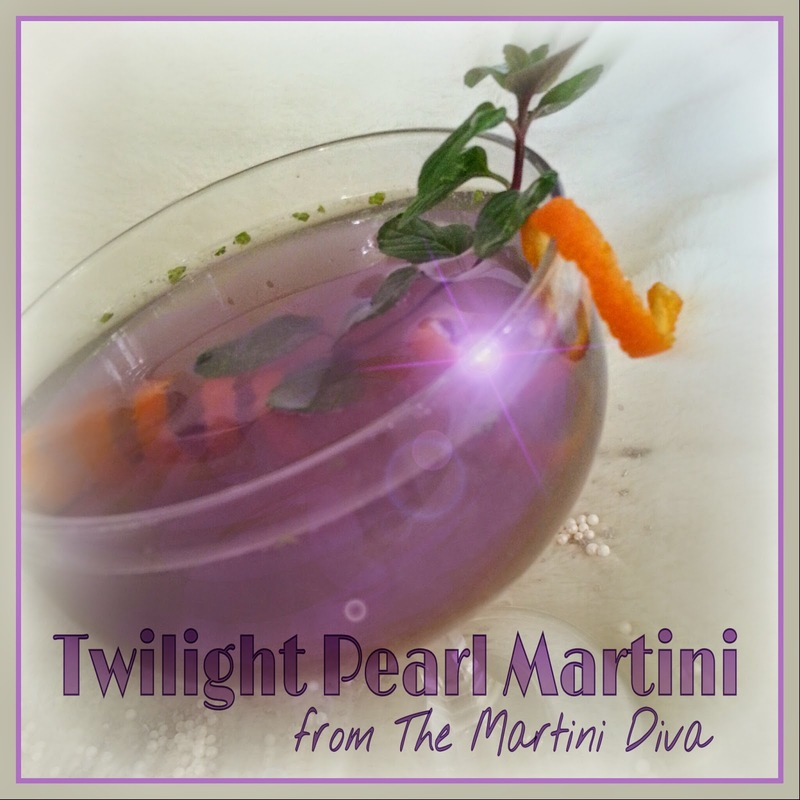 Garnish with a Homemade Maraschino Cherry and an orange twist. The word itself comes from the Gaelic "usquebaugh", (uisge beatha in Scottish, uisce beatha in Irish), with "uisce" being from the Old Irish for "water" and "beatha or bethad" for "of life". Ergo, whiskey is "the water of life"! When whiskey was being exported from Ireland and Scotland to America in the late 1800's the Irish wanted to distinguish their whiskey from what they considered inferior Scottish whisky so they added and "e". Today most Americans and Irish spell it "whiskey" while the Scots still spell it "whisky". 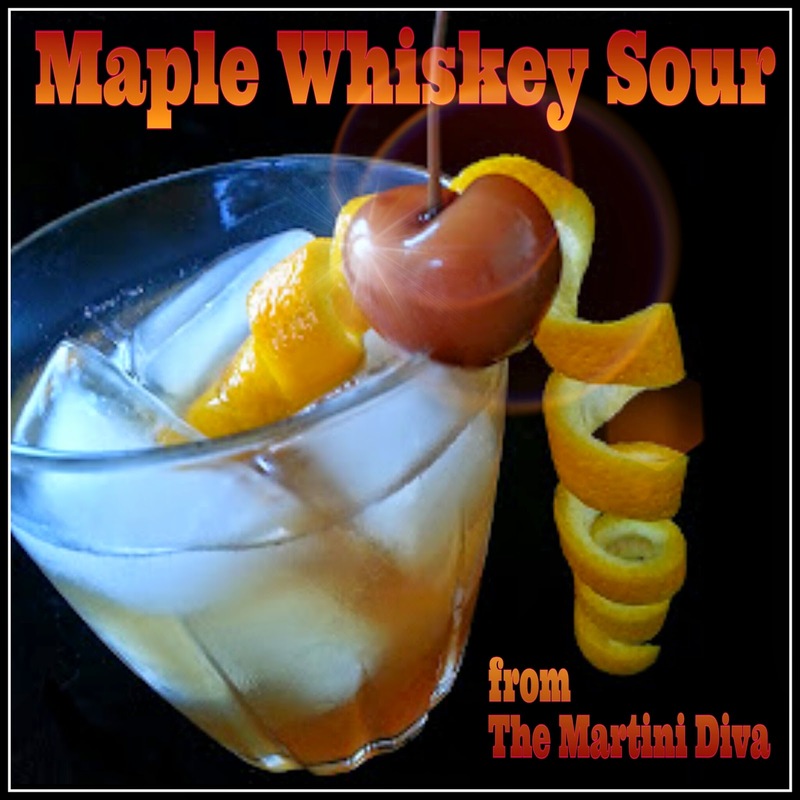 From the historical cocktail class of sours, a recipe for a Whiskey Sour was first published in Jerry Thomas’ How to Mix Drinks (1862), but the first printed mention was purportedly in January 4th 1870 in a Wisconsin newspaper called the Waukesha Plaindealer. A Peruvian newspaper called El Comercio de Iquique states that Elliott Stubb created the "Whisky Sour" in 1872. Add egg white and it's a Boston Sour, add a float of red wine (Claret, Bordeaux, Cabernet) and you have s New York Sour! 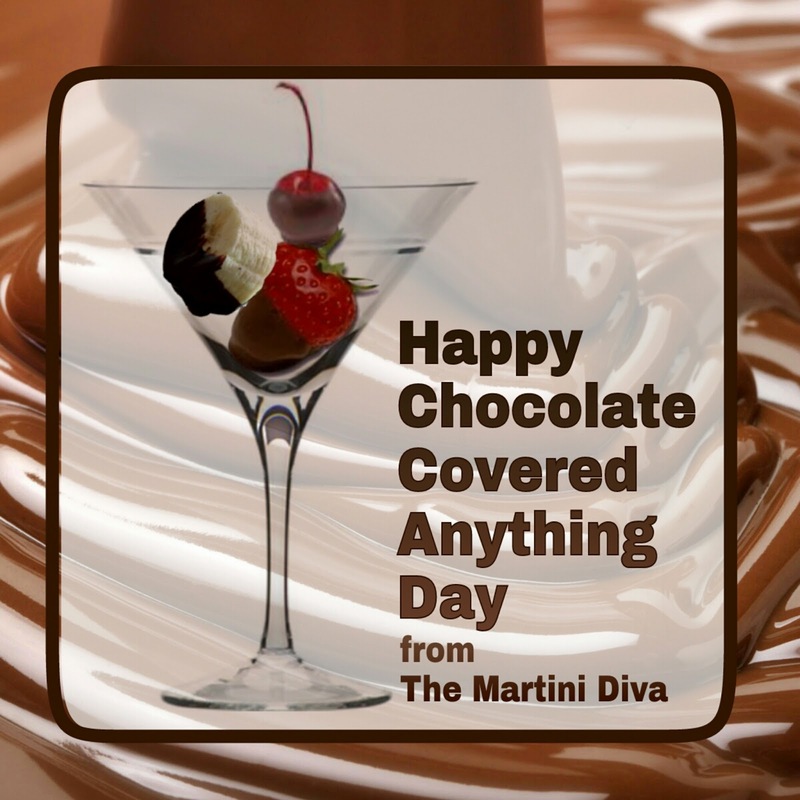 December 16th is National Chocolate Covered Anything Day! You know where I'm going with this? Right to the bar, of course! Below are my favorite ways to enjoy chocolate covered, alcohol infused treats. CHOCOLATE COVERED COCKTAILS Happy National Chocolate Covered Anything Day! 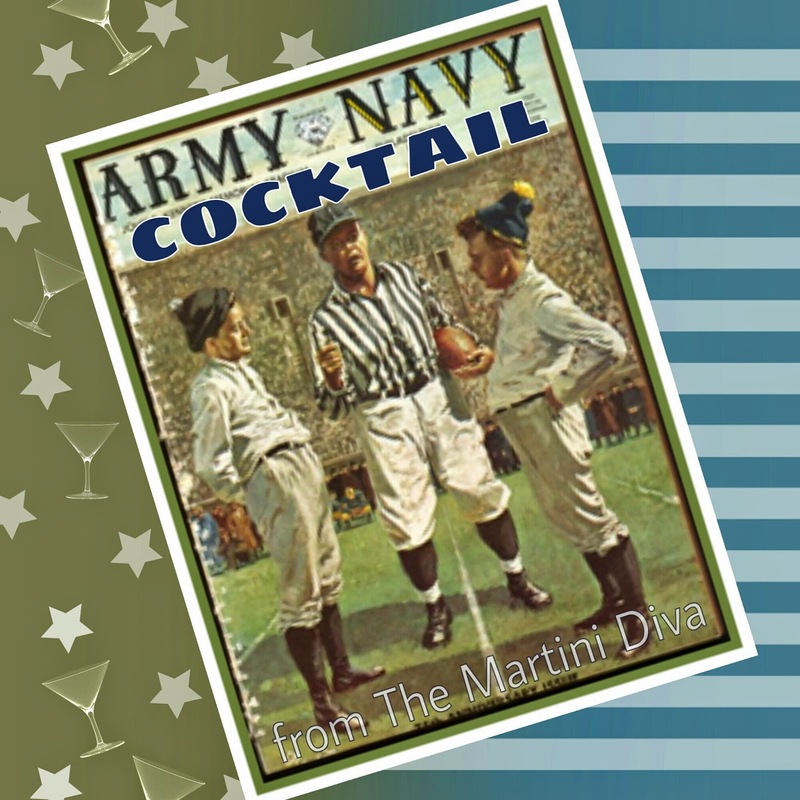 Today is the annual Army-Navy Game so I thought it appropriate to share this recipe for the traditional Army Navy Cocktail. Though not a big football fan, this is the one game I watch every year in honor of my father, a retired Lieutenant Colonel in the Army. Though Dad passed in 1996, I will mix up a batch of these Army Navy Cocktails and watch the game to commemorate those Saturdays of the past where I shared the couch and a few hours of gridiron with my dad. A Little Army-Navy Game History: The Army-Navy Game is a football game between the United States Military Academy (USMA) at West Point and the United States Naval Academy (USNA). The first game was played in 1890, was first aired on radio in 1920 and was first televised in 1945. Now played on the second Saturday in December (though prior to 2009 it was played on the first Saturday after Thanksgiving) it is a traditional college game between the Army Black Knights and the Navy Midshipmen. 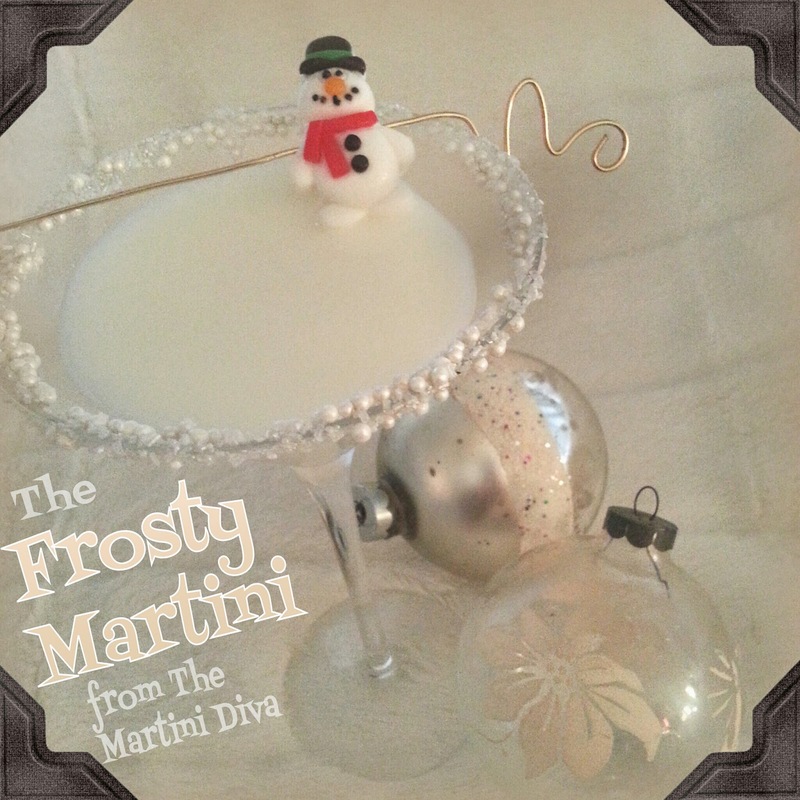 Chill your martini glass in the freezer. Fill your cocktail pitcher with ice, add the gin, lemon juice and Orgeat syrup and stir until chilled. Strain into your chilled glass, twist the lemon over your cocktail to express the oils, then drop in and serve. 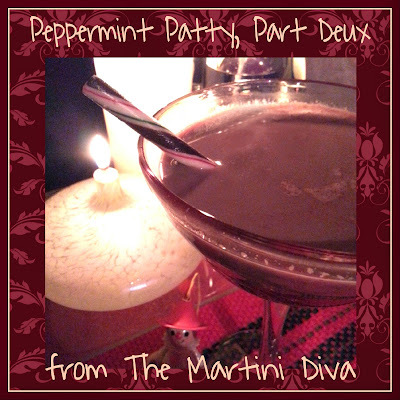 A classic Peppermint Patty cocktail is made from hot cocoa and a splash Peppermint liqueur, typically a peppermint schnapps. That's a time honored recipe, but you know me, I can't leave well enough alone. Prepare the cocoa as directed in my recipe, except leave out the chili powder and cinnamon. Add the quarter teaspoon of espresso powder and stir. Allow this to cool slightly, you want it still warm enough to drink but not so hot it could damage your glass. Pour into your cocktail glass and add your chocolate peppermint candy cane stir stick. Don't leave out the espresso powder, you really won't taste the coffee all that much but it adds a nice accent and balance to the sweetness of the cocoa and the chocolate mint liqueur. I wanted a slight bitterness to balance the sugars, but did not want to bring the herbal qualities of chocolate bitters into play and the espresso powder worked perfectly. A Shandy cocktail is beer, ale or lager typically mixed with lemonade, ginger beer, or ginger ale mixed in half to half ratios. It's a great way to enjoy a refreshing cocktail when you're hot and thirsty because it's fairly low in alcohol. I always think of them as a guy's version of an Arnold Palmer, which is half lemonade and half iced tea. Both are very refreshing, but one includes a form of beer! A Turbo Shandy is a Shandy turbocharged by using an alcohol based lemon ingredient like a hard lemonade. I think this defeats the purpose of what is Shandy is, namely a light alcoholic refreshment which is perfect for a hot day. 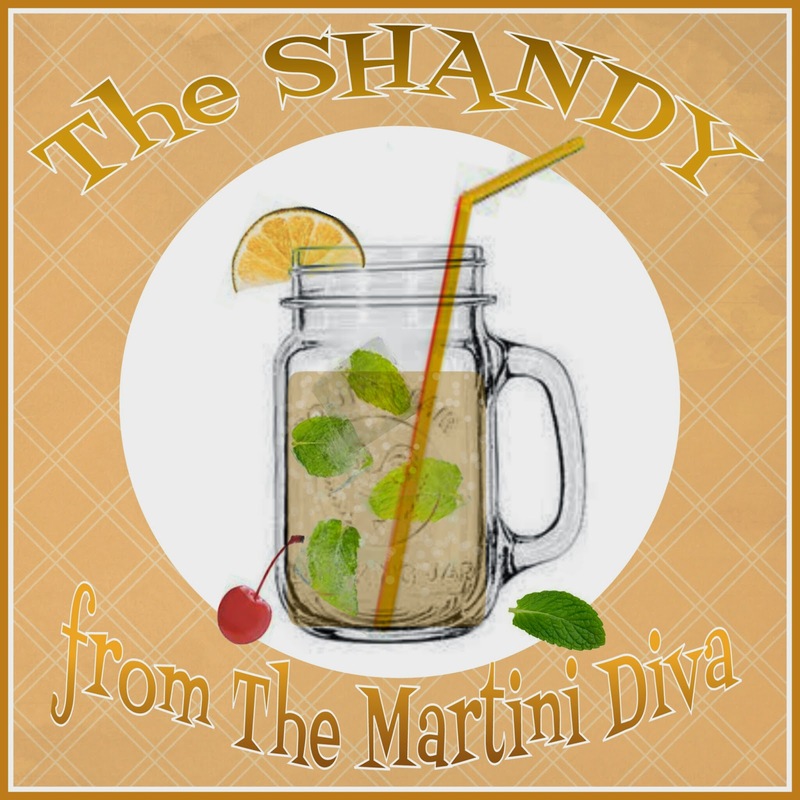 In fact, Shandies are so light in alcohol that in some locations around the world they are exempt from the laws governing alcoholic beverages! *Make your mint infused ice cubes ahead of time by simply bruising some mint leaves and adding to your ice cube tray or mold before adding the water. Tip: Chill your mugs in the freezer when you freeze the ice cubes so the mugs will be icy cold and frosty when you're ready to mix your Shandy. Pour the lager, ginger ale and lemonade over the mint ice cubes then garnish with a lemon slice, sprig of mint and a Maraschino cherry. Brownies are one of those foods that can make everything better. They're chocolatey and rich and chewy and they can take the sting out of a bad day, especially if they're 40 proof. 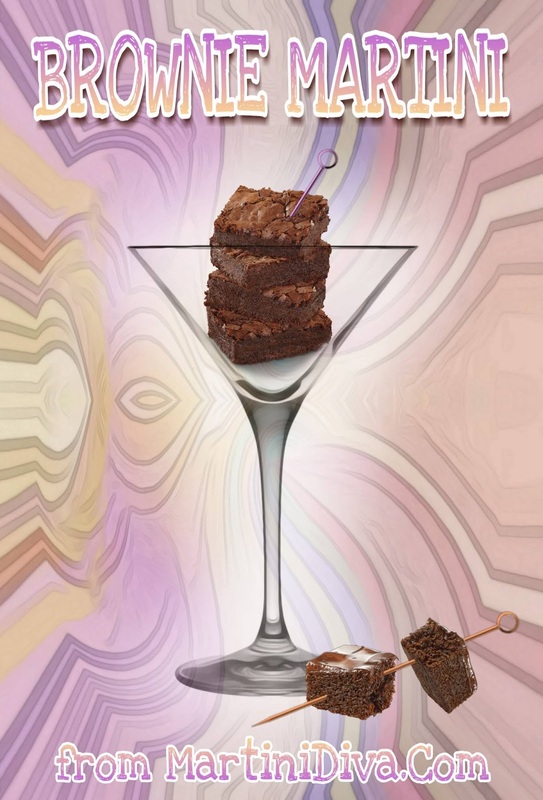 BROWNIE MARTINI Just for you, because you deserve it. DIRECTIONS Chill your glass in the freezer. Fill a cocktail shaker with ice then pour in the chocolate vodka, Irish cream, dark creme de cacao, butterscotch schnapps, sea salt and the half and half. Shake until well blended and chilled then pour into your chilled and rimmed cocktail glass. Garnish with a couple of brownie bites on a cocktail pick and sip your bad day away. There now, doesn't that feel better? National Brownie Day is December 8th. Set up a Cotton Candy Martini Bar complete with individual cocktail shakers, martini glasses, a bucket of ice, different flavors/colors of cotton candy, assorted mixers, garnishes and a fun assortment of flavored spirits. 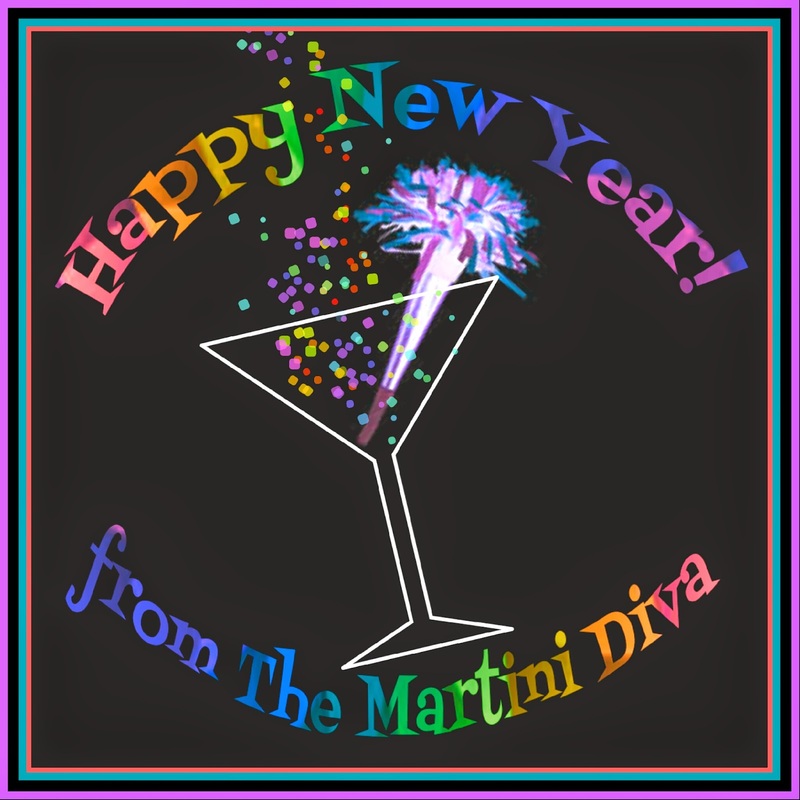 Don't forget some fun, colorful cocktail napkins, paper plates and paper coasters from The Martini Diva Boutique! Have chilled pitchers of the various unsweetened fruit juices including fresh lemon, lime, orange, pineapple, and cranberry juice, along with some chilled cans of plain and flavored soda waters. Add an assortment of fruit and fun candy garnishes and some colorful cocktail picks then let your guests shake their own combos and watch the merriment ensue. The fun part is watching the cotton candy melt as the cocktail mixture is poured over. If you really want to go all out you can buy a small cotton candy machine. Tip: You can buy pre-bagged cotton candy in a large variety of colors and flavors from Walmart, other superstores and online. DIRECTIONS 1. Add ice to the cocktail shaker. 2. Add the vodka then the lime or lemon juice and shake well. 3. Add any sodas AFTER shaking. 4. Pile your chilled glass high with cotton candy. 5. 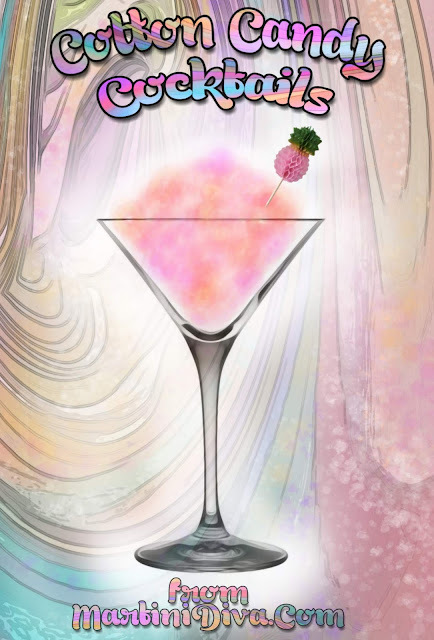 Strain the cocktail directly over the cotton candy. 6. Add the fun garnish. 7. Enjoy!